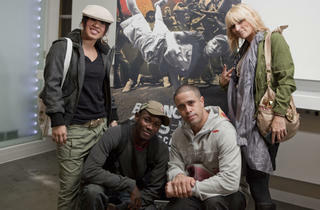 Rock Steady Crew founding member Richard “Crazy Legs” Colón brought new priorities back from his trip to Uganda. Photograph: Carlo CruzB-girl Bonita, Abramz and Crazy Legs of the Rock Steady Crew, from left, with Lady Jules at the premiere of Bouncing Cats in Los Angeles. Photograph: Carlo CruzBreaking at the premiere of Bouncing Cats in Los Angeles. 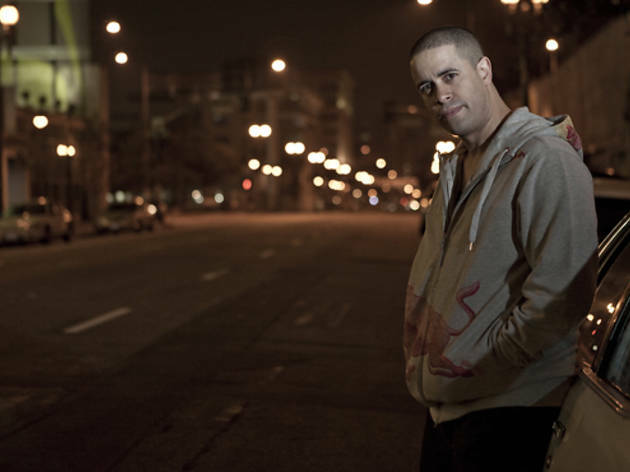 You probably know Rock Steady Crew founding member Richard “Crazy Legs” Colón from his appearances in ’80s breakdance time capsules Beat Street, Style Wars and Wild Style. Aficionados will know his cameo, in a bad wig and black leotard, as one of Jennifer Beals’s body doubles in the audition scene from Flashdance. 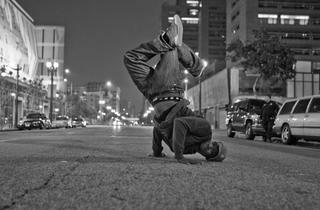 His latest moves onscreen are in Bouncing Cats, a documentary about Breakdance Project Uganda (BPU) and its founder, Abraham “Abramz” Tekya, by Australian-born music video director Nabil Elderkin. Narrated by Common and featuring interviews with Mos Def, Will.I.Am, and Somali MC K’naan, the film screens Saturday 16 as part of the Chicago International Movies and Music Festival. 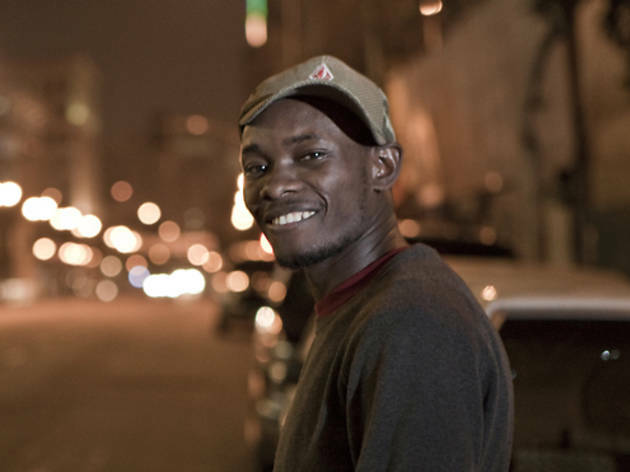 Abramz, a Kampala, Uganda dancer/MC who lost both parents to AIDS at the age of seven, invited Crazy Legs to be a BPU guest teacher in 2008. In an early scene, the Nuyorican b-boy likens the south Bronx of his youth to “a third-world country,” but he’s brought to tears by the devastation he sees in the slums of Uganda and its war-torn north. 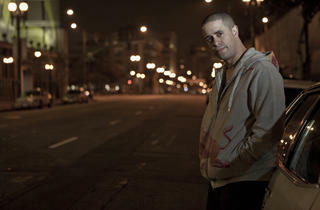 Crazy Legs spoke with me by phone from New York, while he prepped his kitchen for an episode of his live streaming hip-hop cooking show, Lunch Breaks. Who’s coming in for lunch today? Today’s an easy day, it’s just me and my team. We had Biz Markie on the other day. Would you still describe the Bronx you grew up in as “a third-world country”? Nah. Being in Uganda definitely put a different perspective on what I had to deal with as a kid, which was hard in itself, but according to our lifestyle as Americans, you know? You weren’t sniffing glue just to stop the hunger for a few minutes. Forget sniffing glue, they’re sniffing jet fuel. It’s beyond glue, man. How long were you in Uganda? Only eight days, and to experience everything that we did, from getting pulled over on the highway by military who were attempting to extort us, to the living quarters, and just dealing with, Okay, because of this travel situation, we may not eat today. Or, we may eat one meal today. To have money, for example, and to have that not even matter because of everything that they just don’t have over there. Forget about grocery stores. Have you kept in touch with Abramz? 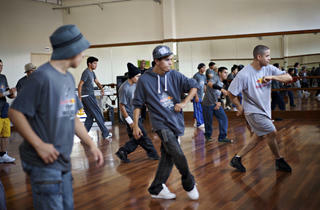 Abramz is a member of Rock Steady Crew now! But communication is very difficult. In an Internet café, within 20 minutes, you may be able to open two emails and respond to them. It might as well be 1991 over there. So what does it mean, then, that he’s a member of Rock Steady Crew now? I made an exception with Abramz, I mean, who wouldn’t want to have such a great asset to human life as part of their organization? But otherwise I’ve stopped bringing people into Rock Steady Crew from other countries. I don’t want it to be too much of a loose-knit organization. How many RSC members are there? We’re going over that this week, actually. We’re doing some…cleaning house. [Laughs] Some people tend to want to ride the name, as opposed to staying productive. But we’re about 40. Tell me about learning traditional African dances as a part of your work with BPU. We did that in Gulu and had a great time, and I talk in the film about how it was a much-needed experience because of how much we were going through emotionally. That was the best part of my trip, the cultural exchange, and how dance was, like, Wow: This is a momentary escape from the reality that’s surrounding me right now. 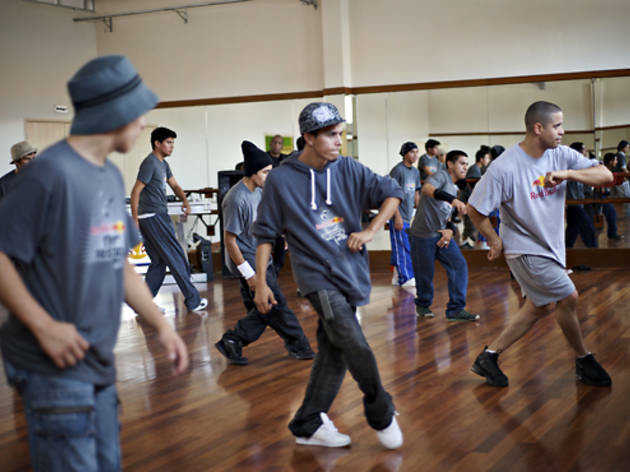 Do you think that escape is what the b-boy lessons with Abramz provide to his students? Yeah, but you have to keep in mind that this isn’t a b-boy film. 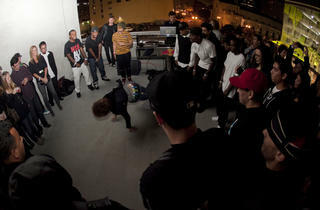 Although hip-hop lends its heart to it, this is not a hip-hop project. This is a human story, about helping people out. Hip-hop is one of the tools, but [BPU is] encouraging people to learn accounting, computer skills, whatever will allow these kids to create a sustainable life for themselves. 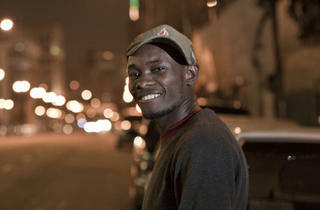 No one’s going out in Uganda, saying, “Hey, life is one big episode of Beat Street and hip-hop will save you,” you know? If anything, that would set them back, because that would be false, blinding them to how to find a better life for themselves. Had you ever learned any African dances before your trip to Uganda? No, the first time was over there. Do you think you’ll pursue that now, back here in the States? Nah. ’Cause it’s just not my thing. There are many forms of art in this world, and my relationship with some of them is just to appreciate them.…Look, I’ve seen African dance plenty of times. But when you see someone doing African dance over there, who could honestly tell you, ‘This is all I have. I have nothing else,’ it’s not the same thing. I mean, that’s the same thing we would tell people, as b-boys and b-girls who grew up in the Bronx, and in other parts of New York: You may [learn to] do it, but you will never get it. I watched African dance over there and thought, Holy smoke, man, this is waaay different from watching [African dance] onstage in the States, or people who take a class as a hobby, you know? After the class is over [here], people go back to their lives. For [the Ugandan dancers], the class is where they live, every day. I’ve been in hip-hop for 34 years. I’ve had a long run, and I’m still runnin’. But this project, by far, has been the most important project that I have ever done in my entire life. It’s become a life commitment. You don’t just go [to Africa] to do your thesis or to put it on your résumé when you graduate from school. [I think that African people] are very aware that Americans do that and never return. I would really like to see people take the approach of, How can I stay in contact after I leave, and continue to help? Because they’re benefiting by having it on their résumé for the rest of their lives. These people are left stranded, until the next person comes through, to make them a part of their school project. Will you return to Uganda, or go elsewhere in Africa? I would love the opportunity. It’s like, Does anywhere need help the way Ugandans need help? Some of my friends who are performers, some of the Rock Steady Crew, there are places [in Africa where] they go to [on tour], and that’s one thing. But from a humanitarian perspective, for goodwill, I would definitely go back to Uganda. 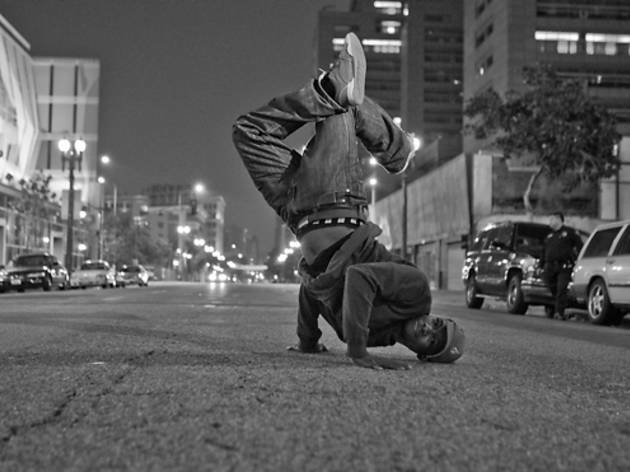 A talkback with Crazy Legs follows the premiere screening in Chicago of Bouncing Cats Saturday 16, part of the Chicago International Movies and Music Festival, at the Wicker Park Art Center (2215 W North Ave, 773-278-7677; 5pm, $10). 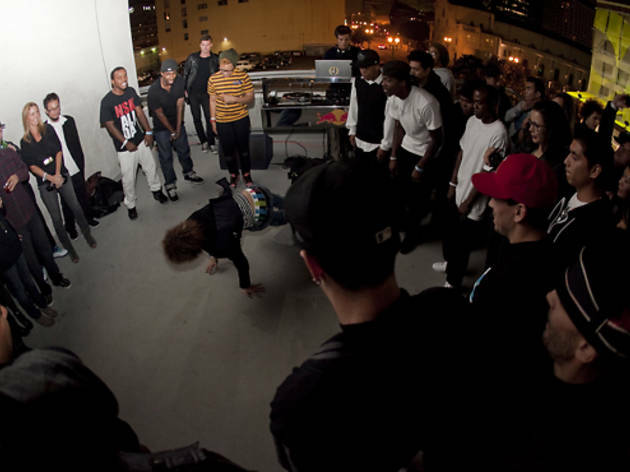 Learn more about Breakdance Project Uganda and make a donation online at bouncingcats.com. Bouncing Cats Trailer from Bouncing Cats on Vimeo.